From the Star Wars: The Last Jedi movie comes the specialized soldier responsible for the execution of First Order soldiers that have been sentenced for treason -the Stormtrooper Executioner! 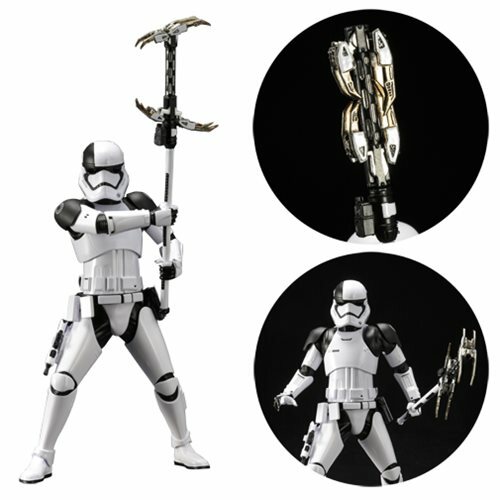 The First Order stormtrooper executioner joins Kotobukiya's ArtFX+ line of 1:10 scale statues. The statue's signature black and white costume and laser axe are rendered in high detail. The statue's feet are embedded with magnets so that you can display it on the special metal stand alongside your favorite characters! The plastic statue stands slightly under 7-inches tall and comes packaged in a closed box. Ages 15 and up.